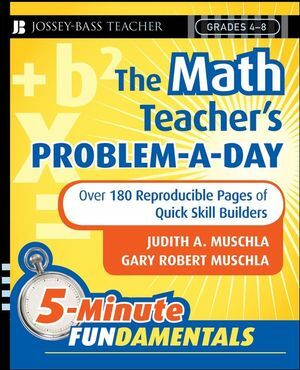 From bestselling authors Judith and Gary Muschla, The Math Teacher's Problem-a-Day is a hands-on resource containing 180 handy worksheets, one for each day of the school year, to help students in grades 4-8 acquire the skills needed to master mathematics. These reproducible worksheets are perfect for "sponge activities"—five-minute challenges to start or end a class period—that can also be used as supplemental lessons, homework, or extra credit. Part of the 5-Minute Fundamentals series, The Math Teacher's Problem-a-Day is an important resource that will help today's students understand more concepts, make connections between branches of mathematics, and apply math skills to a variety of real-life problems. Judith A. Muschla has taught mathematics in South River, New Jersey, for over twenty-five years. She was a recipient of the 1990–1991 Governor's Teacher Recognition Program award in New Jersey and was named 2002 South River Public School Teacher of the Year. Gary Robert Muschla, a prolific author and classroom teacher, taught math, reading, and writing for more than twenty-five years in Spotswood, New Jersey. 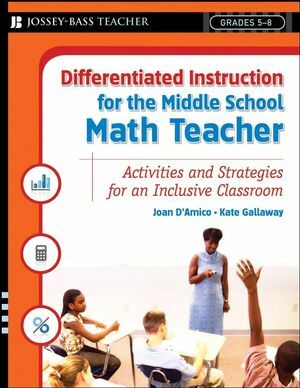 Judith and Gary Muschla have coauthored a number of books including Hands-On Math Projects with Real-Life Applications, Second Edition; The Math Teacher's Book of Lists, Second Edition; Math Starters! ; Geometry Teacher's Activities Kit; Math Smart! ; Algebra Teacher's Activities Kit; and Math Games, all published by Jossey-Bass. Alignment with the Focal Points and Standards of the National Council of Teachers of Mathematics. Section 1: Numbers and Operations. 1.1 Whole Number Place Value Through 100,000. 1.2 Whole Number Place Value Through 100 Millions. 1.4 Multiplication by One-Digit Numbers. 1.5 Multiplication by Two-Digit Numbers. 1.6 Multiplication of Multidigit Numbers, I. 1.7 Multiplication of Multidigit Numbers, II. 1.10 Divisibility Rules for 2, 5, and 10. 1.11 Divisibility Rules for 4 and 8. 1.12 Divisibility Rules for 3, 6, and 9. 1.13 Multiples and Least Common Multiples. 1.14 Factors and Greatest Common Factors. 1.15 Prime and Composite Numbers. 1.17 Division by One-Digit Divisors. 1.18 Division by Two-Digit Divisors, I. 1.19 Division by Two-Digit Divisors, II. 1.20 Division by Two-Digit Divisors, III. 1.24 Multiplication and Division with Money. 1.25 Reading and Writing Decimals. 1.26 Decimal Place Value Through Hundred-Thousandths. 1.27 Decimal Place Value Through Millionths. 1.29 Comparing and Ordering Decimals. 1.32 Addition and Subtraction of Decimals. 1.33 Estimation of Decimal Sums and Differences. 1.34 Multiplication of Decimals by Powers of Ten. 1.35 Multiplication of Decimals, I. 1.36 Multiplication of Decimals, II. 1.37 Division of Decimals by Whole Numbers. 1.38 Division of Decimals by Decimals. 1.39 Division of Decimals by Decimals (with Zeroes as Placeholders). 1.41 Estimation of Decimal Products and Quotients. 1.42 Models of Equivalent Fractions. 1.45 Whole Numbers, Fractions, and Decimals on a Number Line. 1.46 Comparing and Ordering Fractions. 1.47 Addition and Subtraction of Fractions with Like Denominators. 1.48 Addition and Subtraction of Fractions with Unlike Denominators. 1.49 Fractions and Mixed Numbers. 1.50 Addition and Subtraction of Fractions and Mixed Numbers with Like Denominators. 1.51 Addition and Subtraction of Mixed Numbers with Unlike Denominators (with Regrouping), I. 1.52 Addition and Subtraction of Mixed Numbers with Unlike Denominators (with Regrouping), II. 1.53 Estimation of Fraction Sums and Differences. 1.54 Multiplication of Simple Fractions. 1.55 Multiplication of Fractions and Mixed Numbers. 1.56 Multiplication of Mixed Numbers. 1.57 Division of Simple Fractions. 1.58 Division of Fractions and Mixed Numbers. 1.59 Division of Mixed Numbers. 1.60 Estimation of Fraction Products and Quotients. 1.61 Expressing Fractions as Decimals. 1.65 Equivalent Fractions, Decimals, and Percents. 1.66 Percents of Numbers, I. 1.67 Percents of Numbers, II. 1.68 Finding Numbers When the Percent Is Known and Finding the Percent. 1.69 Discounts and Sale Prices. 1.70 Tips and Total Bills. 1.72 Simple and Compound Interest. 1.73 Percent of Increase and Decrease. 1.77 Positive and Negative Numbers. 1.78 Addition and Subtraction of Integers. 1.79 Multiplication and Division of Integers. 2.2 Non-Numeric and Growing Patterns. 2.4 The Commutative and Associative Properties. 2.6 Order of Operations, I. 2.7 Order of Operations, II. 2.9 Expressions and Equations, I. 2.10 Expressions and Equations, II. 2.13 The Relationship of Addition and Subtraction. 2.14 The Relationship of Multiplication and Division. 2.15 Writing and Solving Equations, I. 2.16 Writing and Solving Equations, II. 2.17 Writing and Solving Equations, III. 2.19 Graphs of Simple Equations. 2.22 Linear Equations in Two Variables. 2.23 Slope of a Line, I. 2.24 Slope of a Line, II. 2.25 Slope of a Line, III. 3.6 Types of Triangles, Classifi ed by Sides. 3.7 Types of Triangles, Classifi ed by Angles. 3.8 Angles of a Triangle. 3.9 Angles in a Polygon. 3.10 Parallel Lines and Transversals. 3.16 Glides and Refl ections. 3.22 Similar Triangles and Parallel Lines. 3.25 Relating Two-Dimensional Shapes to Three-Dimensional Prisms. 3.26 Relating Two-Dimensional Shapes to Three-Dimensional Pyramids. 4.1 Classifying and Measuring Angles, I. 4.2 Classifying and Measuring Angles, II. 4.3 Area of Rectangles and Squares, I. 4.4 Area of Rectangles and Squares, II. 4.5 Area of Triangles, I. 4.6 Area of Triangles, II. 4.8 Area of Irregular Figures. 4.9 Surface Area of Prisms. 4.10 Volume of Prisms, I. 4.11 Volume of Prisms, II. 4.14 Circumference and Area of Circles. 4.15 Surface Area of Cylinders. 4.17 Measurement in Linear Units. 4.18 Measurement of Weight and Capacity. 4.21 Area of a Sector. 4.23 Distance Between Two Points on the Cartesian Plane. 4.24 Angles to Find Height and Distance. 5.8 Line Graphs and Bar Graphs. 5.9 Ordered Pairs on a Coordinate Grid. 5.12 Mean, Median, and Mode, I. 5.13 Mean, Median, and Mode, II. 5.17 Lines of Best Fit. 5.18 Correlations and Lines of Best Fit. 5.20 Theoretical Probability and Predictions.